Greetings! 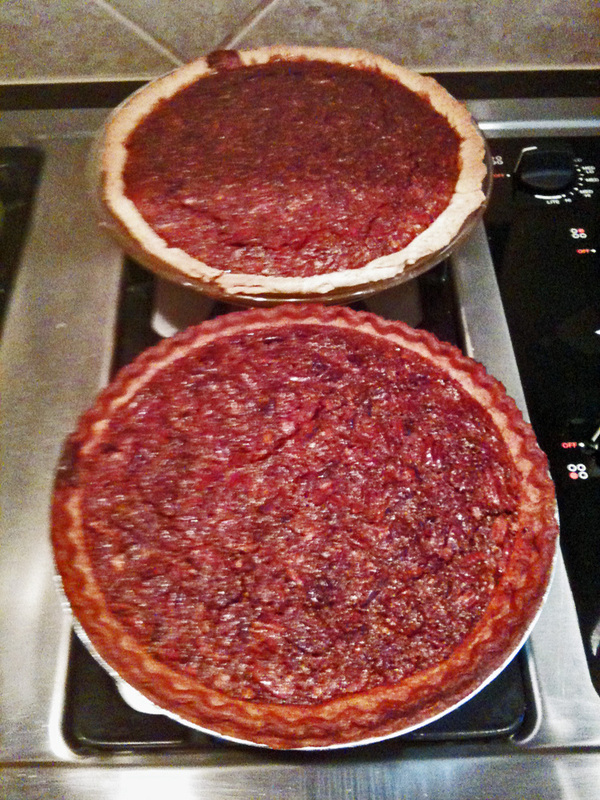 For this weeks pie, I baked a toasted-pecan pie. It’s a relaxing day to bake here in Austin. It’s cloudy and cold and the NFL playoffs are in full swing. I’m hoping it’ll be the Packers and the Jets in the Super Bowl. Add 4 tbsp. of cold water until moist clumps form.Add 1 tbsp. at a time if the mix is dry. Gather the dough in a ball, flatten, and wrap in plastic wrap. refrigerate for at least one hour to chill. Pre-heat oven to 350 degrees. Coarsely chop 2 cups of pecans and hold in reserve. Spread the remaining cup of pecans on a rimmed baking sheet. Toast in oven until nuts are aromatic and dark in color, about 12 minutes. Cool the pecans completely and grind finely in a processor. Maintain your oven temperature. Whisk the eggs in a large bowl until frothy. Add sugar, corn syrup, melted butter, vanilla, salt and ground toasted pecans; whisk until blended. Mix in chopped pecans. Pull the crust from the freezer and fill the crust. Bake the pie until the crust is golden brown and filling is puffed and set (the center of the pie may move slightly when shaken), about an hour and 10 minutes. Transfer to rack and let cool at least 3 hours. Serve slightly warm or at room temperature with fresh whipped cream. This entry was posted in Homemade Pie Crust Pies, Pecan Pies and tagged Baking, Dessert, Pecan Pie, Pecans, Pie, Recipe by pieofthebeholder. Bookmark the permalink.